Early, Surly and Burly – how to register your Driving Licence in Portugal. Our day out, you ask? To the O Instituto da Mobilidade e dos Transportes (IMT) office in Faro to register our British driving licences before the Brexit deadline. (Apologies for mentioning B*****, but it’s a vital part of the story.) The implications of not registering driving licences include fines, being unable to drive and possibly having to take a driving test! 7.30am in the growing queue… which stretched around the corner! While in the queue, we had a panic when we realised that we had a vital bit of evidence missing, so had to dash off to a nearby kiosk for photocopies of driving licences and passports, returning just as they were opening the office. Once inside, we were given a ticket like the ones at the supermarket meat counter – quite apt really…) and readied ourselves for a long wait. What became apparent was that one woman, who had ‘snook’ in the queue, somehow got a handful of tickets from the security guard who was issuing tickets, (apparently there because of scuffles previously because of queue jumpers…). We wondered whether she’d mistaken the IMT for a supermarket meat counter and was planning on having a BBQ, or whether she was an agent, getting tickets for her clients. It turned out to be the latter, not the fatter! Lots of looks and murmurings ensued from some of the disgruntled, but less than rebellious crowd, but no direct challenges. What a sauce that woman had – but not the BBQ type! After 90 minutes of waiting patiently, our numbers came up. Her Outdoors (indoors for a change) was lucky, being served by a pleasant, friendly woman, I on the other hand wasn’t! I was served by a burly, surly woman who took to banging on the glass partition to suppress the noisy, increasingly rebellious hordes. She did this while chomping on her breakfast, avoiding eye contact typing one fingered and who returned my licence by throwing it at me. 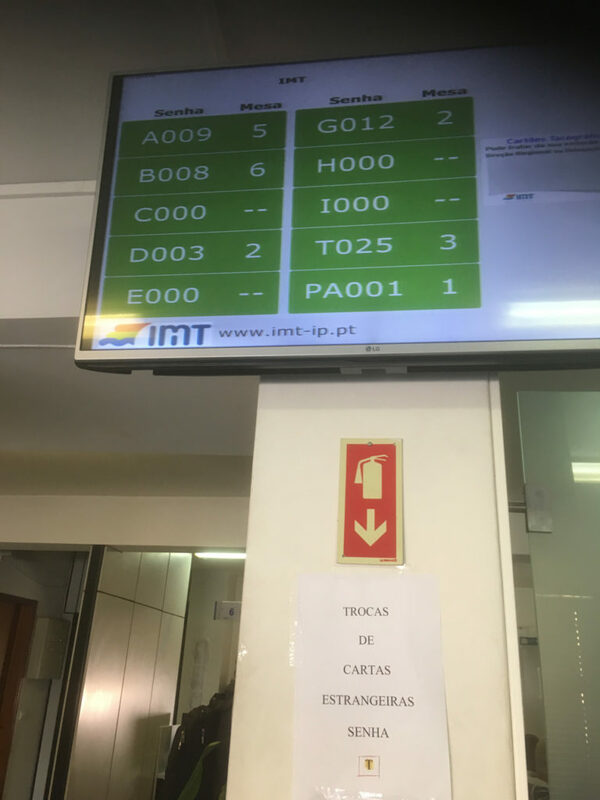 I have some sympathy for someone doing a boring, repetitive job but… It’s one of Portugal’s mysteries how a country full of such lovely, friendly people chooses some of the less lovely and friendly ones to work in the IMT/Camara etc. Or is it that British expats are losing their charm and welcomeness? The actual admin part was quite straightforward, with only a smattering of Portuguese used and some gesticulating. I avoided using any rude gesticulations to convey my thoughts on the experience and was sent on my merry way with a withering hand wave. Afterwards, you will be given a paper that allows you to drive, albeit within Portugal. If the validity of the paper expires before you receive your new licence, all you need to do is to get up at 6am, queue for hours and… Happy driving!